“Take every chance you get in life, because some things only happen once” this quote motivates Harrison Blaske to take every chance in life he can get and to step out of his comfort zone. Harrison lives in Waterville with his parents, Scott and Regina Blaske. 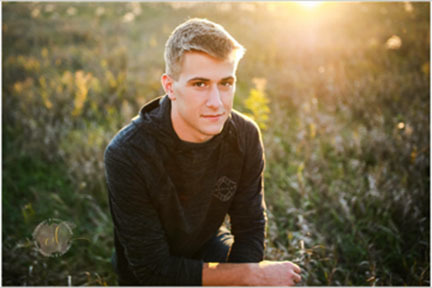 He has participated in Multiple clubs and activities at Valley Heights, participating in football and being the Captain his senior year, basketball, FFA, and track for four years. KAYS club for three years, and Art two years. Outside of school you can see Harrison participating in MAYB basketball tournaments during the summer. Harrison says his dad and grandpa have influenced him the most in life, because they have taught him to work for what he wants. Harrisons says his biggest accomplishment that he is most of proud is being named all league first team for offense and defense in football in his Junior and senior year. One word that describes Harrison is that he is unique because he's one of kind about him. Harrison is different from other people because he is very caring and has big heart but he doesn't care what people think of him. Something you might not know about Harrison is that he almost bit his tongue off in 1st grade. When Harrison leaves Valley Heights he wants to be remembered by how well of an athlete he was and what he did for his team. After high school Harrison plans to attend MATC to become a lineman.